Food trucks may be all the rage, but I’d like to put in a word for someone putting down food roots: Art Jackson, his wife Chelsea, her brother Morgan Kalberloh, his brother (Michael, I think), and the various other folks involved in the operation whose front face is Pleasant House Bakery. (They’re the subject of one of the best-of items mentioned above.) There’s a lot more to their whole operation than this modest cafe, but it’s the entry point, and one of my favorite new places to eat lunch, though it took me till yesterday to actually get there with a camera that had a battery in it (oops). This is Pleasant House the cafe, at 934 W. 31st St. The menu at the moment is short. There are three or four pot pies like the one above, maybe one pasty, some sides like mashed potatoes or, at the moment, English peas with mint, and some housemade sodas (the ginger is pretty great). There are also some English style meat products for sale most days, like bangers or back bacon, made by Darren who writes one of my favorite charcuterie blogs, Low on the Hog. 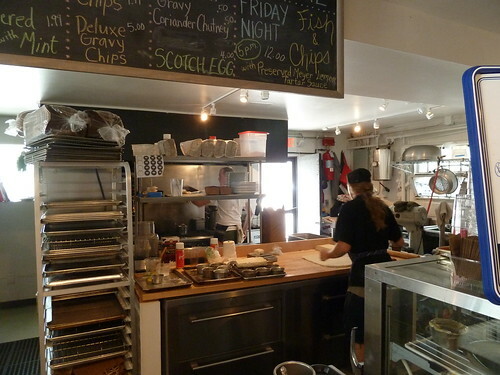 (Bizarrely, he’s been in one of my videos too, albeit briefly— he was working at Leopold when it opened.) Bangers aren’t my favorite as a style, but I really liked the back bacon, if you see that, grab it. 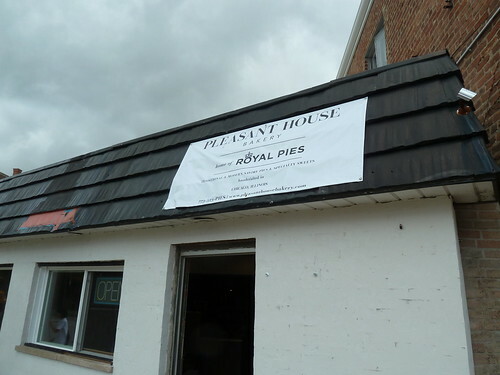 There’s more to Pleasant House than this cafe— indeed, Pleasant House seems to be less a storefront than a state of mind. The name comes from Art’s grandfather’s farm in Yorkshire, but besides serving as the name of Art and Chel’s blog, it’s also come to stand for his parents’ farm west of Chicago, and the rapidly growing networks of vegetable plots on which they grow some of the vegetables they use (which was two when I wrote the Reader piece, but was already up to four by the time I had lunch there yesterday). It’s also their homemade soaps and beauty products, and will grow to include desserts one of these days, and… who knows what’s all in Art’s head, but he clearly has a vision, which he’s pursuing full time, of a sustainable life in which you grow what you use and you use the heck out of what you grow and try to be as self-sustaining with good and beautiful things as possible. But how’s the food you ask? I’ve tried three of the savory pies. A steak and ale one is fine, but it’s what you expect, nice braised beef and vegetables. I say zip past that conservative choice and try the “chicken balti,” so bright with curry (and the coriander chutney that comes on the side) that just breaking it open released wafts of enticing aroma. 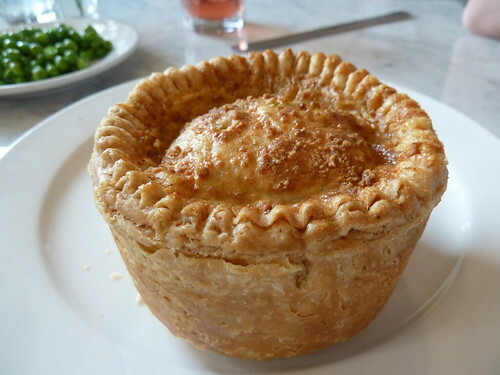 But my favorite, indeed probably my favorite vegetarian thing in the city at the moment, is the kale and mushroom, as robust and comfy as a meat pie, but with all the self-congratulatory virtues of leafy green vegetables. 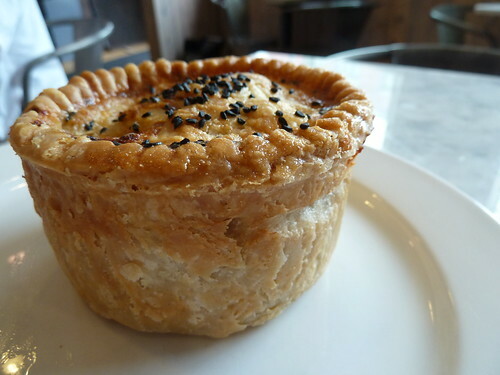 A dish like this, and the vision and support system behind it, is what lifts Pleasant House’s savory pies way above the trend du jour (meat loaf, cupcakes) and makes it one of the great things in the city that is changing the way we eat. Eat this city at Pleasant House.